(Bloomberg) -- The European Central Bank is set to tweak its forecasts lower for euro-area economic growth as global trade tensions damp external demand, according to officials familiar with the latest projections. The predictions for output have been cut slightly starting this year, the people said, asking not to be named because the assessment is still confidential. The U.K. and Turkey are among nations dragging on demand, though the U.S. outlook is still positive, the officials said. The darker outlook comes at an awkward time for the Governing Council as it prepares to wind back stimulus, though the adjustments probably aren’t big enough to derail those plans yet. The path of inflation, the primary consideration for monetary policy, is largely unchanged, the officials said. The euro slipped after the report and traded at $1.1589 at 12:22 p.m. Frankfurt time. The ECB committee that oversees the compilation of the forecasts now sees the risks to economic growth as tilted to the downside, according to the people. While that’s a change from policy makers’ latest view that the risks are “broadly balanced,” the Governing Council could choose to disagree with that assessment and keep its existing language at its meeting on Thursday. President Mario Draghi, who will unveil the final projections after the Governing Council meeting, has acknowledged the damage to confidence from protectionist threats and global uncertainties in recent months. Since then, Turkey and Argentina have slid deeper into crisis, triggering turmoil across the emerging-markets world, and the U.K. is still at risk of breaking away from the European Union without a trade agreement. Economists surveyed by Bloomberg last week said they expect officials to confirm that monthly bond buying will be reduced to 15 billion euros ($17 billion) from 30 billion euros starting next month, before ending in December. Interest rates are seen rising in late 2019. 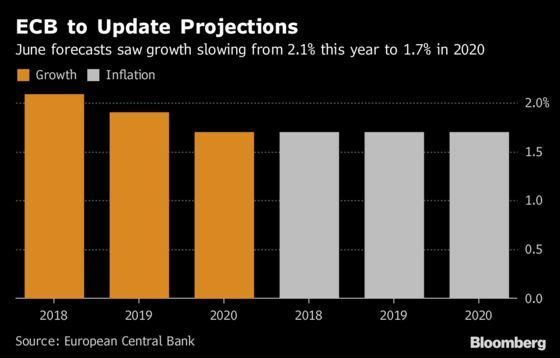 In June, the ECB predicted economic growth would slow from 2.1 percent this year to 1.7 percent in 2020, with inflation averaging 1.7 percent in all three years covered in the forecast.